KMS are pleased to announce that from Thursday 3rd January 2019 we will be meeting at a new venue. We have entered into an occupancy agreement with St John’s Methodist Church on Bodmin Road in St Austell to use one of their meeting rooms from the beginning of the new year and until further notice. We would like to place on record our thanks to Pastor John Keast OBE for his part in making the arrangement possible. 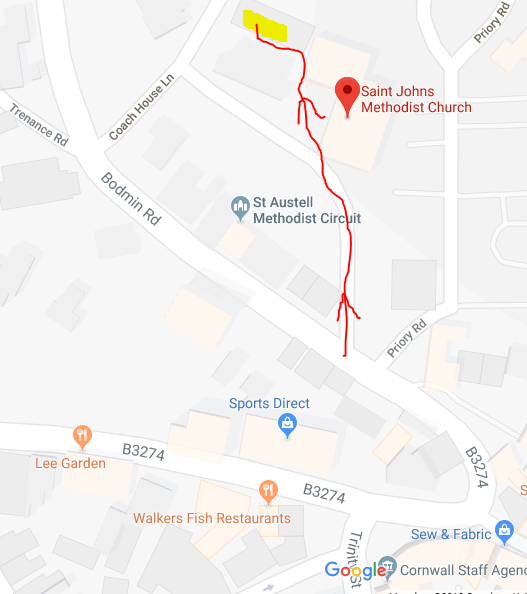 You can find us on the map below by walking (shown in red below) up the driveway from Bodmin Road into the church premises. At the top of the drive continue with the Church doorway to your right and then walk up the side of the Church up towards the buildings at the rear. Take the path in front of the buildings and enter through the last door on the right, shown in yellow below. There is no parking in the church premises but parking is available within a few moments walk at The Priory Road Car Park. Wheelchair access is available as there are no steps to negotiate from the driveway to the building entrance.